Bo and Michelle Johnson officially become owners of Yogurt Jungle on Dec. 1. They have planned an open house for Dec. 5. Yogurt Jungle is getting a new owner. When the Maricopa shop opened in 2011, it was Sharilynn Hewitt’s second store (the first in Queen Creek). Economically, it was a challenging time to open a new business, but she was able to manage the ebb and flow. This fall, she turned the reins over to Michelle Harl Johnson and her husband Bo. They officially take over Dec. 1 and are planning an open house Dec. 5 from 11 a.m. to 3 p.m. It is a chance to meet the new owners and even win prizes on Spin the Wheel. “We want to grow it and advertise, advertise, advertise to get the name out there, so people know we’re here and we’re here to stay,” Michelle Johnson said. Johnson, a manager at Chili’s in Casa Grande, has been in the food business since she was a teenager in Pennsylvania. She worked three years at McDonald’s and then went on to Applebee’s and Chili’s. In the meantime, she moved to Arizona in 1998. Serious about a career in the business, she went to school, commuting twice a week to the University of Nevada-Las Vegas for three years to earn her bachelor’s degree and then picking up her master’s degree as well. Her work and education were aimed at delivering food to an eager public. When: Dec. 5, 11 a.m.-3 p.m. 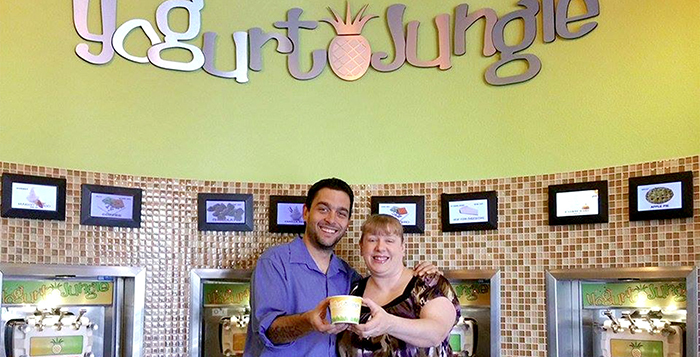 When Hewitt started looking for a new owner of the nearly 5-year-old business, Michelle and Bo gave Yogurt Jungle a good look. The Johnsons moved to Maricopa three years ago. “Yogurt Jungle will continue to be a family-owned and now locally-owned business,” Hewitt posted to her Facebook customers in announcing the sale. Favorite job: McDonald’s – it laid the base for my career. Why this business: It’s fun. Kids love it. People love it. Why Maricopa: It’s got a small-town feel but is close to the big city. Best business advice you received: Follow your heart. Best business advice you gave: If your dreams don’t scare you, they’re not big enough. Musical genre: I love it all.